BACKGROUND: There are an increasing number of studies using simulation models to conduct cost-effectiveness analyses for type 2 diabetes mellitus. OBJECTIVE: To evaluate the relationship between improvements in glycosylated haemoglobin (HbA1c) and simulated health outcomes in type 2 diabetes cost-effectiveness studies. 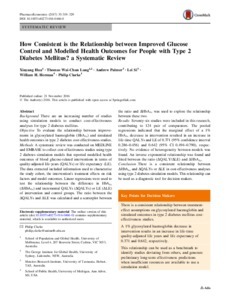 METHODS: A systematic review was conducted on MEDLINE and EMBASE to collect cost-effectiveness studies using type 2 diabetes simulation models that reported modelled health outcomes of blood glucose-related interventions in terms of quality-adjusted life-years (QALYs) or life expectancy (LE). The data extracted included information used to characterise the study cohort, the intervention's treatment effects on risk factors and model outcomes. Linear regressions were used to test the relationship between the difference in HbA1c (∆HbA1c) and incremental QALYs (∆QALYs) or LE (∆LE) of intervention and control groups. The ratio between the ∆QALYs and ∆LE was calculated and a scatterplot between the ratio and ∆HbA1c was used to explore the relationship between these two. RESULTS: Seventy-six studies were included in this research, contributing to 124 pair of comparators. The pooled regressions indicated that the marginal effect of a 1% HbA1c decrease in intervention resulted in an increase in life-time QALYs and LE of 0.371 (95% confidence interval 0.286-0.456) and 0.642 (95% CI 0.494-0.790), respectively. No evidence of heterogeneity between models was found. An inverse exponential relationship was found and fitted between the ratio (∆QALY/∆LE) and ∆HbA1c. CONCLUSION: There is a consistent relationship between ∆HbA1c and ∆QALYs or ∆LE in cost-effectiveness analyses using type 2 diabetes simulation models. This relationship can be used as a diagnostic tool for decision makers.